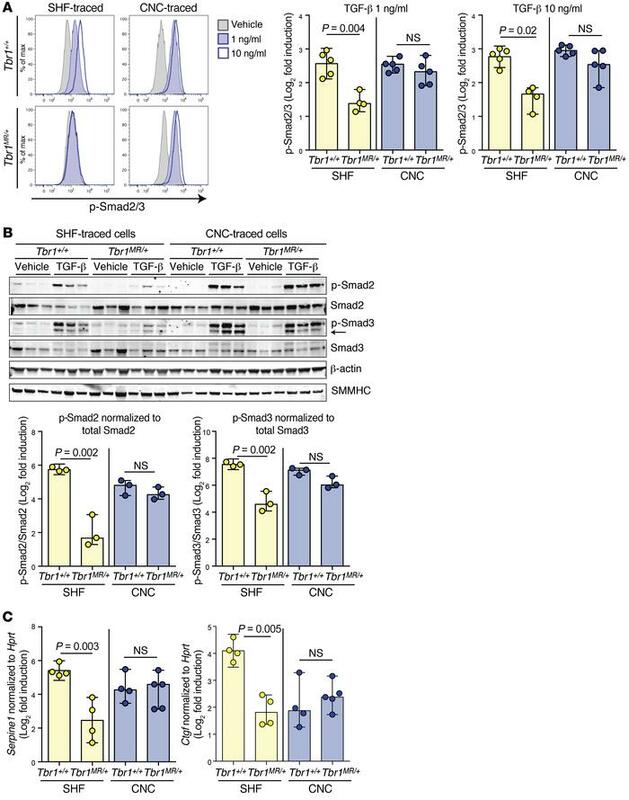 Defective induction of Smad-dependent pathways in SHF-, but not in CNC-derived, primary VSMCs generated from Tbr1MR/+ mice. (A) Representative flow cytometry histogram plots and quantification of p-Smad2/3 induction over baseline in serum-starved SHF- and CNC-derived VSMCs from mice of the indicated genotypes after exposure to 1 ng/ml or 10 ng/ml TGF-β1 for 1 hour. Levels of p-Smad2/3 were assessed by phospho–flow cytometry using an antibody specific for p-Smad2/3 (SHF samples: control n = 5, mutant n = 4; CNC samples, control n = 5, mutant n = 5). P values shown refer to Kruskal-Wallis test with FDR-based multiple comparison correction. (B) Immunoblot of cell lysates from serum-starved SHF and CNC-derived VSMCs stimulated with 1 ng/ml TGF-β1 for 1 hour. Levels of p-Smad2 and p-Smad3 were assessed with antibodies detecting p-Smad2 or p-Smad2/3; arrow identifies the band quantified for p-Smad3. Quantification of p-Smad2 and p-Smad3 induction relative to baseline is shown below (n = 3). P values shown refer to Kruskal-Wallis test with FDR-based multiple comparison correction. (C) Quantification of normalized Ctgf and Serpine1 induction relative to baseline upon stimulation of serum-starved SHF- and CNC-derived VSMCs from mice of the indicated genotypes with TGF-β1 (10 ng/ml) for 3 hours (SHF samples: control n = 4, mutant n = 4; CNC samples, control n = 4, mutant n = 5). P values shown refer to Kruskal-Wallis test with FDR-based multiple comparison correction. Numerical data are presented as scatter dot-plots with boxes, with the box denoting the mean; error bars identify the 95% confidence interval. NS, not significant.